@Axam: Did you run gpu-switch integrated.bat prior to executing apple_set_os.efi? This is a necessary step with the dGPU equipped MBP. Otherwise, your boot will hang 100%. @Eason85: No problem. apple_set_os.efi is not a script - it is an UEFI binary that calls Apple’s proprietary interface in the firmware, much lower level than OS. So it is selected as a boot disk when starting up, thus the need for USB? No, I didn't run gpu-switch. Should I run integrated.bat from safe mode wit pre-loaded apple_set_os.efi or normal boot without apple_set_os.efi? Also, should I run dedicated.bat before booting to MacOS? The same steps should work with the Mid 2015 15" (M370X) MBP as well. Not sure if this is the right thread but hoping you can help. I have a Macbook Pro 8,2 running 10.12.4/Windows 8.1 in UEFI mode. I'm trying to get the intel hd 3000 graphics driver installed in Windows without it crashing. When I try to boot Windows directly, it hangs and then restarts, presumably since I disabled the radeon gpu. rEFInd's implementation doesn't work either. If you’re already using my compiled EFI, and still the same, your MBP firmware is too old and does not support that UEFI protocol. Ah, bummer. I was trying it by selecting the compiled EFI from within rEFInd, I'll try one last time w/o rEFInd and just blessing your EFI directly, but sounds like I'm SOL. Prior to installing the Intel Iris Pro 5200 drivers, I uninstalled the AMD drivers with DDU. When the iGPU is loaded with gpu-switch the dGPU gets Code 31. No need to disable the PCIe 16x bridge as ryokun6 mentioned. I finally got this to work on my system: 2016 MacBook Pro Touchbar/RP460. However, when I disable the PCIE port above the Radeon GPU my screen instantly goes blue and Windows crashes- restarts. This happens though I'm sure I'm using the Intel GPU, the Radeon GPU shows error 31, and even is manually disabled. When I restart my system with eGPU plugged in after Windows logo it works without error12. I go back and forth constantly between Mac and Win though so I have to keep enabling and disabling the Radeon GPU. Is there something I need to do so my system doesn't crash each time I disable it? @edwardsean: you should disable/enable the parent PCIe downstream port of the eGPU, not dGPU. The dGPU can be completely disabled. Mac firmware defaults to dGPU, so you have to use gpu-switch integrated.bat if the dGPU activates again. seems yesterday my display doesn't show any picture when the egpu is working, just black screen on the internel display. the display is definitely working but no picture. no blacklight issue! when i start the macbook everything disconnected from the macbook after the bootlogo black screen, the apple logo on other side is not lightning. in windows bootcamp! internal display is working normally , also the egpu with external monitor is working normally. if i start the macbook in OS X with HDMI, external monitor and internal display working again normally. in recovery mode, display working normally. after all, i erease the main HDD also bootcamp partition and did clean install, of OSX! after installation , bootlogo black screen, the front apple logo is no longer shinin as before the clean installation. i restart the macbook with HDMI again, display and monitor r working normally in osx. @goalque - I am trying to figure out whether or not there is a way to modify the bootmgfw.efi file to include the apple_set_os.efi coding so that way i could rid myself of having a usb stick hooked up to my macbook on windows boot. Alternatively, can one simply add a small partition on the internal hard drive following the instructions laid out in this thread as a workaround to produce the same result? Chainloading to avoid reselecting the startup disk doesnt seem like its an easy task for a mere novice like myself. You can't modify bootmgfw.efi. If the EFI Shell is too limited, you can try boot loaders such as rEFInd or GRUB2 to chain load apple_set_os.efi. rEFInd has it built in. My automate-eGPU EFI allows external EFI executables but it is a closed source project and I don't have time for further development. @Nando: we can also contact the creator of rEFInd, inform about new Mac firmwares so that spoof_osx_version starts working again, and advice him to update links pointing to egpu.io instead of TI? @goalque , good point. I've just emailed Roderick, the rEFInd creator, asking for spoof_osx code to be updated with your fix. The first post and 0xbb's apple_set_os V1 code was linked for reference. How do I check if it's UEFI compatible? Is the Macbook Air 11" Mid 2012 (A1465) UEFI compatible? I don't think it is... Then there is no solution? There is no UEFI information under system information. - Is there a way to avoid selecting "BOOTCAMP Windows" as the start up disk? I would refer use my Mac HD as the default start up disk and never change that. - Is there a way to avoid the usb stick? The last posts discuss that issue but I don't really understand what's going on. If there is a solution, step-by-step instruction would be awesome. 2016 13'' Macbook Pro with touchbar. THANK YOU!!! I am definitely going to try this out with rEFInd tonight. Hopefully it all goes well. Note that when I select the boot entry for apple_set_os.efi, my macbook's internal display flickers, and the rEFInd boot menu comes back. I then selected Windows and booted with both the iGPU and the eGPU. @Fred: MacBookAir5 is on the list of "PreUEFIModels". I think Nando's software supports older MBR installations. However, please still try as we're not sure whether some pre-UEFI models have the necessary protocol in the firmware (supposedly not). My Macbook instantly freezes when I try to boot from the from the UEFI boot disk. Let's see if I can find Nando his software. However, when I copy these commands into Win10 command prompt(admin) it says the syntax is not correct. When I type them into terminal in Mac OS it says there is no such file or directory. Where do I type in these commands, so they are recognized? Also, where do I put the downloaded apple_set_os.efi file so that the commands can locate it to copy? You need to create a mount point and mount the EFI partition first. I was able to figure it out, I think. But, as soon as it worked I disabled the dGPU. I went to Mac and when I went back to Windows, the screen stalls on the Win logo. Windows continues to load successfully, but the screen just stays on the logo without functioning. I need to be able to switch to the iGPU but I can't see anything to do it. apple_set_os.efi doesn't chain load Windows. There's an icon to boot into Windows, and gpu-switch is the only tool on the OS side to force iGPU. I'm not sure I understand. In that case how can the dGPU be left permanently disabled? When you go back to Mac and then back to Win the PC will be switched to the dGPU which has been disabled. So the screen won't function before you can switch to the iGPU and you will be stuck as I am without being able to see anything. It seems to me that you have to reenable the dGPU before you make the roundtrip from Mac back to Windows. Is this right? Alternatively, I'm thinking of assigning a keyboard shortcut so I can activate the integrated bat without a screen, and then restart. The dGPU can be left permanently disabled if you execute integrated.bat each time after Windows has loaded, shut down, re-run apple_set_os.efi, and chain load Windows boot.efi (rEFInd's icon for example, or manually from the UEFI Shell). If you boot into macOS, I guess the dGPU activates again. Integrated.bat is more reliable method than setting the value from macOS. In order to automate this process, deeper knowledge how a gmux device works and EFI programming skills is required. gpu-switch can be used only from the operating system side, not in EFI environment. Hi Goalque. The issue I'm having is that when I go to MacOS, the system switches to the dGPU. The dGPU is enabled in MacOS, so it works, but it remains disabled in Win10 and does not get automatically reactivated. So, booting back up in Windows goes to a screen set to the disabled dGPU. This of course doesn't work. I'm wondering how others are getting around this problem, or if they reenable the dGPU each time before heading to MacOS, which is what I was doing previously. Disabling the dGPU on Windows has nothing to do with how the firmware controls the iGPU/dGPU. If the dGPU wants to be activated, it does so and you cannot determine its status from the Windows device manager. Operating system and the EFI are two separate worlds. Thanks Goalque, that's helpful to know. I think that the "two separate worlds" is the problem I'm having. The firmware activates the dGPU so it functions on MacOS irregardless of its disabled status in Windows. When I switch back to Windows, the screen is still active during boot up in the firmware. 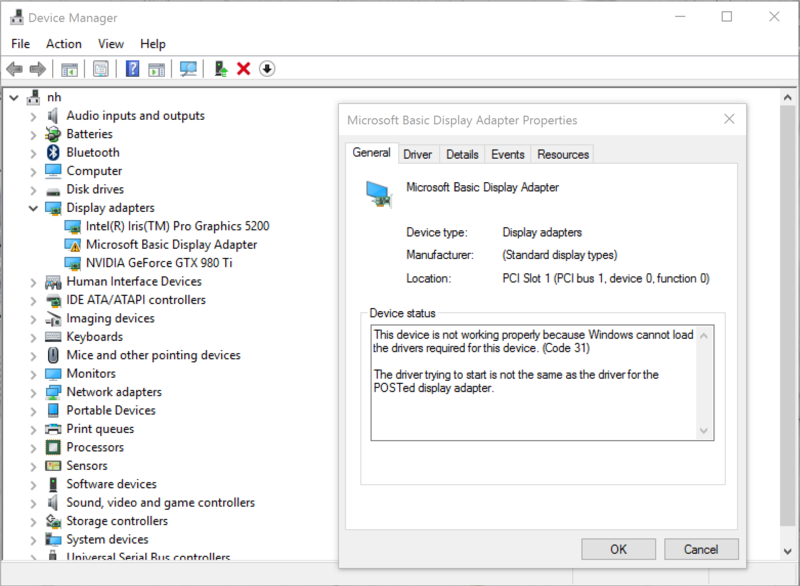 The issue is that, as soon as it enters Windows OS, the screen no longer functions because the dGPU remains disabled in the OS device manager. I think this is what you meant by the separation of EFI and OS. Otherwise, if you meant that the firmware controls the dGPU so that it typically overrides the device manager even in the OS, in my system the dGPU is not being re-activated by the firmware within WinOS. Yep, it's either dGPU or iGPU that gives the light and pixels. The macOS is able to dynamically change which one is wired to the internal LCD as "automatic graphics switching" is turned on under energy saver settings. You can see the active GPU under Graphics/Displays (hit Cmd + R to refresh the view). This is not possible on Windows, so the firmware defaults to use dGPU (in EFI). Of course both iGPU and dGPU can be "active" under device manager if the Windows can allocate resources for both. apple_set_os.efi's purpose is just to bring the iGPU back to life (in EFI world) when booting into other operating systems, and it may help with system resource allocation as the iGPU becomes primary. Thanks for clearing that up Goalque. Honestly, don't know what we'd all do without the generosity of people like you, Nando, Enjoy. For me, I'd be stumbling around in the dark without "light and pixels." I'm having a problem here. After going through the steps, I can't boot into bootcamp after applying the apple_set_os.efi under reFind. It always stucks in a blue screen, however, booting into safe mode in windows is possible and it do shows two gpu under the device manager. Any one knows what's going wrong? By the way I'm using Macbook Pro Retina 15' mid 2015 with an amd dGPU. Sorry for my poor English. Recently viewed by users: OliverB 48 mins ago, Eightarmedpet 47 mins ago.